Despite living in a hyperconnected world, individuals are more disconnected from each other and themselves than ever before. 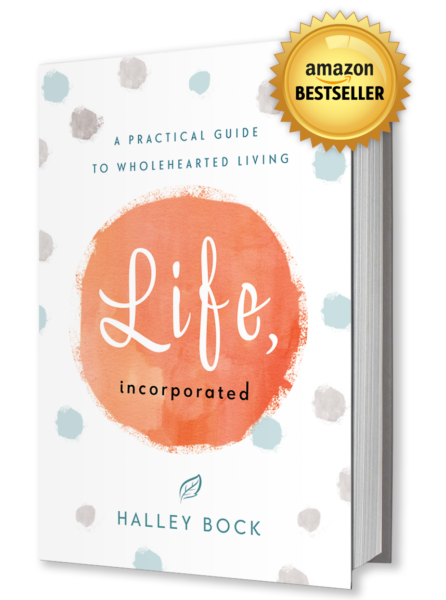 In her engaging new book, Life, Incorporated: A Practical Guide to Wholehearted Living, Halley Bock inspires readers to slow down, wake up, and pay mindful attention to all facets of life in order to generate self-worth and to live whole, more gratifying lives. In conversational prose, Bock shares her own experiences and guides readers toward purposeful living–what she terms as living life from the inside out, with topics ranging from inner life and well-being, personal mission statement to core values, avocation and vocation, and relationships. Bock’s focus on connection to the self and others makes Life, Incorporated particularly intriguing. Life, Incorporated is a must-read for anyone interested in redefining and recapturing life and provides a revolutionary alternative to the age-old money = happiness mind-set. Bock expertly braids her personal path to fulfillment with compelling activities, thought-provoking quotations, and life-changing lessons that will captivate readers along with a journal component to ensure the reader can put this work into practice. Securing mindfulness and balance–from the inside out–is the only way to achieve fulfillment and real happiness. Bock shows the reader just how to make that happen.